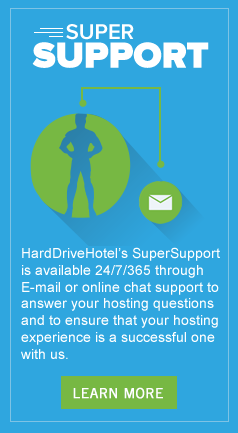 HardDriveHotel’s SuperSupport is available 24/7/365 to assist clients in managing their web hosting activities. The SuperSupport team is available to answer your hosting questions including resetting passwords, verifying the settings on your new mobile and electronic devices, assisting with the installation of 3rd party applications as well as re-installs of your operating systems. We know reliability, customer support, and security are important to your success. To ensure we meet your needs, we purchase high quality hardware and equipment, build reliability and redundancy into our systems and perhaps just as importantly, provide customer support systems that are built to exceed your expectations. Unlike many hosting providers, Hard Drive Hotel provides the same high level of support to our smallest clients that we do to our largest. We know that no matter what size hosting plan you have selected with us it is mission critical to you. Our customer service technicians work hard to ensure your hosting experience with Hard Drive Hotel is successful. To reach our SuperSupport team, we recommend submitting a support ticket via the online client portal. 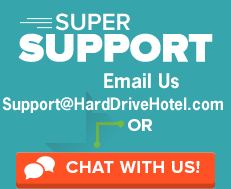 The SuperSupport team can be reached by emailing support@harddrivehotel.com directly or using our contact us form in which your email will be filtered into our support ticketing system. During standard business hours, the SuperSupport team is also available through our online chat function and by phone. We do encourage you to use the online ticketing system as these requests are auto-assigned to the appropriate department and/or technician for priority response. SO, WHY HARD DRIVE HOTEL? Our 24/7/365 support team is dedicated to managing your hosting environment. Each of our support team members have spent a number of years in the industry, including many members with 25+ years of experience supporting hosting providers. Their experience has provided them the opportunity to gain knowledge in range of configurations and hosting solutions. Their knowledge is beneficial to our clients as they can help create custom solutions for your unique configuration and hosting needs. Ensuring your solutions retain their uptime requires high quality equipment. We work with a number of hardware vendors to provide clients with high quality, new hardware. In the rare event the hardware was to experience a failure, inventory is kept onsite to ensure replacement is readily available to get your services back online as quickly as possible. Controlling our own network, purchasing high quality equipment, and employing experienced support team members are only a few examples of how we have built reliability into our systems. We understand if your web services are down, your business is down. Redundancy is the key to maintaining uptime. We strive to ensure there is no single point of failure among any system within our network. In almost all instances, we even have a backup to our backup. We understand there is always a risk for failure, but we also understand if you take precautions and build redundancy into your systems the risk for failure is greatly diminished. Royal Oak, MI data center! Our data center in Royal Oak, Michigan was built with redundancy in mind, we have multiple generators, redundant power sources, multiple network carriers, etc. Our data center allows us to control the entire network and services that support the network and your servers. By having these redundancies in place and the backing of our support team extensive knowledge and expertise, we have maintained greater than 99.9% uptime since opening in April 2008.